When you think of refreshing, light dessert, you probably think of ice cream first. If we think of winter desserts, we probably think of heavier fare – cookies fresh out of the oven, luscious chocolate cake, and thick layers of icing. No matter the season, the tart is the perfect treat. Tarts are lighter than a cake or cookie, but can still take on those rich flavors from things like cream or dark cocoa. They can also take on a light whip, fresh summer fruits, and seasonal produce brilliantly – warm or cool weather. Plus, they’re beautiful to serve and rustic-looking with a very distinct charm about them. 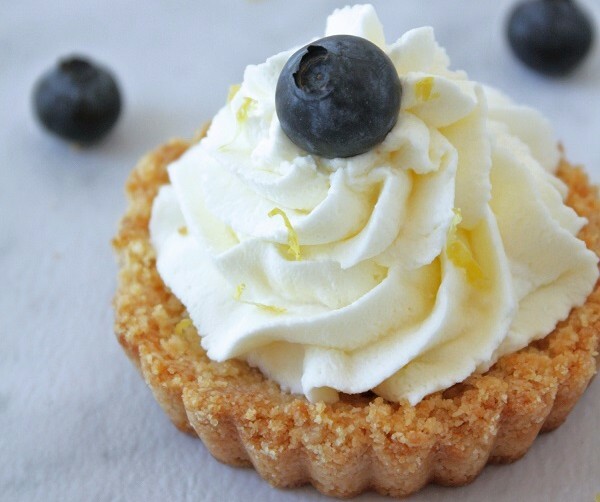 These grain-free, paleo-ish tarts are perfect for showing off the beauty of the fruit! From raw crusts to mascarpone fillings, and lemon infusions to chocolate cream, we’ve got tarts, galettes, and fruity fun for you to indulge with throughout the seasons. Whether you’re entertaining or just looking for a fun project – because these are so Instagram-worthy – we’ve got a recipe for you. Fresh figs have a short season, but if you can get your hands on some at the right time, this tart is perfect. If you have a tree, you know all about it! Take advantage of the bounty. This beautiful fruit was meant to steal the show, and this vanilla-infused tart is the perfect way to show ’em off. This is the perfect delicate and picturesque dessert for a fancy occasion or simple summer entertaining. Get the recipe from Colorful Eats. The contrast in colour arranged on this tart is a feast for the eyes. In a single bite, you’ll experience the tart, juicy, and sweet burst of flavour that comes from a unique blend of kiwi and blueberry. This dessert is rich with nutrients and antioxidants. The base is gooey and delicious, plus it’s made from entirely raw ingredients. The star of the show is what’s packed in between, though – a dairy-free banana and cashew cream. Here’s one for the chocolate lovers! Fortunately, berries pair up exceptionally well with cocoa. The show stopper in this recipe has to be the middle layer of vegan chocolate ganache. It’s rich, creamy, and spoon-lickin’ good – you might even be tempted to lick the bowl, too. Plus, it’s just TWO ingredients! Don’t miss out on the ultimate sweets combo. Get the recipe from Bakerita. Is anything more beautiful than a galette? The fruit is folded carefully – but not too carefully – in a gorgeous, flaky and fluffy, grain-free crust, and it’s dusted with a generous layer of shaved, toasted almonds. You can almost smell it as it rises in the oven! This recipe is actually quite simple in terms of baking and ingredients, and it’s so worth making as the centerpiece of your table. Low-carb? Yes, please! These tarts feature a lemon and almond shortbread dough, made raw with a mixture of nuts, seeds, and naturally sweet dates. The filling is a satiating blend of mascarpone and heavy whipping cream, packing in the most flavor from those healthy and hearty fats! Top it off with fresh berries, or reach for frozen. You can easily make these single-serve bites for a party in a muffin tin if you don’t have a tart tin, or just make the recipe in a full-size pie pan. Get the recipe from I Breathe, I’m Hungry. Ah, here’s another one for the chocoholics! A really wonderful pairing that really lets you savor the rich flavors of dark chocolate and those earthy undertones is citrus. It helps bring out everything that is good about chocolate. Basically, this tart is a party in your mouth. This raw treat features a buttery macadamia and cocoa crust, plus the option to use fresh oranges OR orange essential oils, so you can really make it during any season. Experiment with different citrus, or get a little crazy with some blood orange for the winter months. Get the recipe from Becomingness. You just can’t go wrong with custard. Alongside raspberries, it’s another summer staple. It’s delectable, sweet, and creamy without being too heavy. This is an excellent indulgence. Plus, this custard is jam-packed with nutrient-dense ingredients like pastured egg yolks, grass-fed gelatine, and delicious coconut milk. The cookie crust is reminiscent of lemon bars. Get the recipe from Paleo Running Momma. Our favorite secret ingredient might just be oh-so-versatile avocado. Somehow, this fruit ends up in everything. Its mild, buttery flavor and texture lend itself well to savory dishes and desserts – especially when “creamy” is the goal. A burst of citrus comes from lime in this dish, sticking to the “all things green” theme. It’s like key lime pie all grown up, no-bake style. Get the recipe from Running to the Kitchen. If you want to appear as though you are the master of dessert – even if you’ve never baked before in your life – this recipe is CLEARLY the way to go. Meyer lemon filling. Meyer lemons are slightly sweeter than regular lemons, and come in season during summer. Get the recipe from The Kitchen McCabe. What makes a fruity, healthy, grain-free tart even better? Ice cream, of course! Or rather, “nice cream,” which is made from frozen fruit. It’s a match made in heaven. This simple, four-ingredient tart combines the two for a tropically-inspired blend of papaya and strawberries. The base is a blend of dates and mulberries for an interesting spin on a raw crust, adding some super food power. Get the recipe from Unconventional Baker. Swoon. Can you believe this is low-carb and keto-friendly?! Chocolate and peanut butter are SO meant to be together. Just look at those thick layers of delicious, healthy, high-fat awesomeness! The crust is packed with almonds and fibre-rich flaxseed, the middle layer is simply butter and nut butter (talk about heaven!!! ), and the top layer is a whipped avocado and cocoa blend. You don’t have to wait for a holiday to make this autumnal tart. It’s loaded with seasonal crisp and warmth from delicious apples and pears, plus tart cranberries to balance everything out. The top of this tart is a work of art in its own right, and it’s totally worth the effort for the ‘rose’ effect. The compote is infused with fresh orange zest and beautiful, aromatic vanilla while the crust has notes of brown butter. Get the recipe from Our Food Fix. Let us know what your favorite summertime fruit combos are in the comments below, and share this with your friends who could use a healthy sweet tooth fix! Share this roundup post on Pinterest from here!